Hailed by one reviewer as the creative business "bible," and considered the authoritative book on the subject for over ten years, The Business Side of Creativity is back, updated and revised to include even more invaluable facts, tips, strategies, and advice for beginning creatives. Every year the market for creative services expands, but the competition is increasing even faster. Today, success hinges not on talent alone, but on a thorough understanding of the business side of creativity. 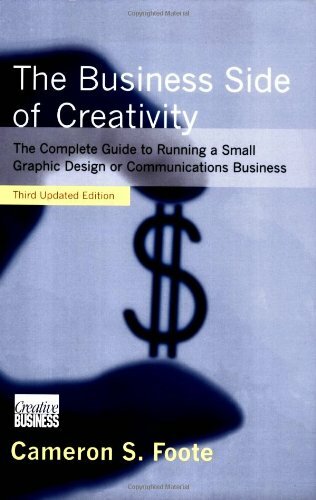 The Business Side of Creativity is the most comprehensive business companion available to freelance graphic designers, art directors, illustrators, copywriters, and agency or design-shop principals. Cameron S. Foote, a successful entrepreneur and editor of the Creative Business newsletter, guides you step-by-step through the process of being successfully self-employed - from getting launched as a freelancer to running a multiperson shop to retiring comfortably, and everything in between. Sample business forms and documents to help put the information into practice are included in the appendixes, and are available for downloading. How should you organize? What should you charge? What marketing techniques yield the best returns? How do you know when it's right to expand? What are the most effective strategies for managing employees? How can you build salable equity? The Business Side of Creativity delves into these questions and hundreds more and gives you practical, real-world answers and invaluable expert advice. Include in Your Creative Career.